(3) Skwentna - All mushers hit this checkpoint at the junction of Skwentna and Yentna rivers the first night of the race. As many as 40 teams may campe here. (4) Finger Lake - After Finger Lake comes the treacherous descent down Happy River Gorge. (5) Rainy Pass - At 3,771 feet, the highest point on the trail. The actual checkpoint is on Puntilla Lake. (6) Rohn - Was an original Iditarod roadhouse for dog teams carrying mail. The Roadhouse is gone, replaced by a cabin built in the 1930s. (9) Takotna - Pretty, welcoming village known for its fresh pies. Favored spot to take the 24-hour layover. (10) Ophir - Ghost town. (11) Iditarod - Abandoned mining town halfway along southern route. First musher here gets $3,000 in gold. (12) Shageluk - Open water on the trail from Iditarod can be a problem. 507 miles to Nome. (13) Anvik - First checkpoint on the Yukon River, which mushers follow for 148 miles. (14) Grayling - Last village until mushers reach Kaltag, 130 miles upriver. Population 194. (15) Eagle Island - Ralph Conaster's cabin is the only dwelling here. Fierce headwinds often slow mushers. (16) Kaltag - Mushers leave Yukon River at village of 230. (18) Shaktoolik - Hurricane-velocity winds and ground blizzards can cut visibility to zero quickly. Trail crosses Norton Sound to Koyuk. (19) Koyuk - Once to Koyuk, the rest of the trail is over land. Just 171 miles to Nome. 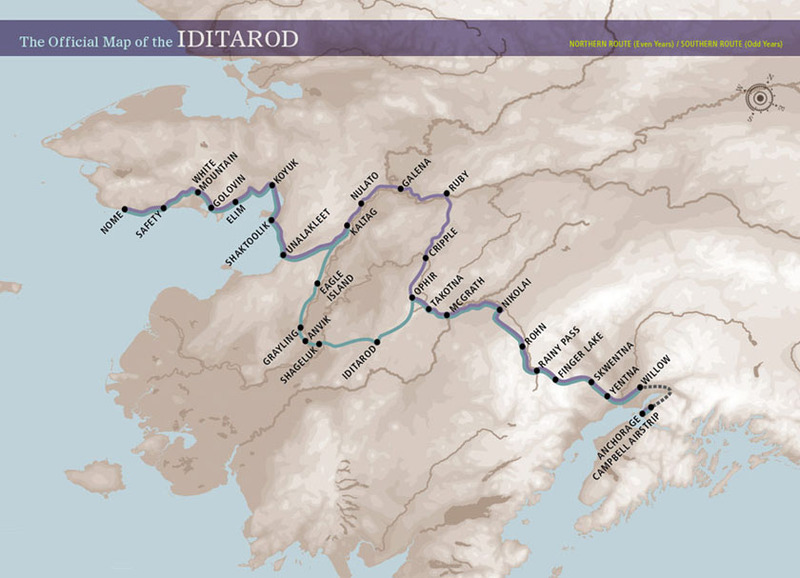 (21) Golovin - Trail runs straight for 10 of the 18 miles to White Mountain, then crosses Fish River delta. (22) White Mountain - Mushers take final mandatory rest here, an eight-hour stop. 77 miles to Nome. (23) Safety - Last check, 22 miles from finish.